It was an innocent question. I was leaning on a fence watching a lesson in an outdoor arena at a stable near Centreville, Virginia. But the girl I posed the question to (early 20s, like I was, also in riding boots) took it hard. Her face crumpled. I thought she was going to cry. “I don’t have a horse,” she said. It was like I had slapped her. She looked away. My face got hot. Awkward silence followed. What was wrong with me? Since when did I assume that everyone leaning on a fence in riding boots owned a horse? I was a horse owner at that time, but I hadn’t been for long. I had clawed my way out of the horseless state and never looked back. The clawing started when I was in middle school. At 12, I convinced the school bus driver to drop me off at a riding stable two miles from home. I convinced a trainer there to let me ride in exchange for barn chores. The bus driver didn’t care either way. The trainer had a chunky liver chestnut Quarter horse that could benefit from some free attention and exercise. Over the course of a year or so, Whiskey and I walked, trotted and cantered our hearts out on solo trail rides through the woods. We jumped anything in our path. I sang to him when geese flew overhead and sent him into spasms of jigging. I never thought twice about the long horseless walk home. In high school, I had a friend with a barn in the backyard, two horses, the full Pony-Club lifestyle and a swimming pool. I considered Staci’s life to be supremely perfect. While I realize now that no one’s life is perfect, I was envious. Her wonderful mom got me involved in Pony Club and always had a horse on the trailer for me. But I stuck out. Those pony clubbers all had families who bought them ponies, wardrobe for every equestrian occasion, horse trailers and trucked them around to clinics, meetings, rallies and horse trials. These days, as a parent, when I think back on what Staci’s mom did for me, it makes me quake a little bit with appreciation and amazement. Once I overheard her tell someone that I had a beautiful touch with horses. It was a compliment that still makes me smile 30 years later. What a difference a horse makes! This happy picture was taken not long after Windy became mine in 1993. But back to the horseless girl standing at the side of the arena that day. I still feel bad about that. But the takeaway is clear to me now: Every day I appreciate the fact that I am not horseless. And I am so grateful to the many people who helped me with horses along the way, including that cranky Loudoun County school bus driver who didn’t care where the heck she dropped me off. 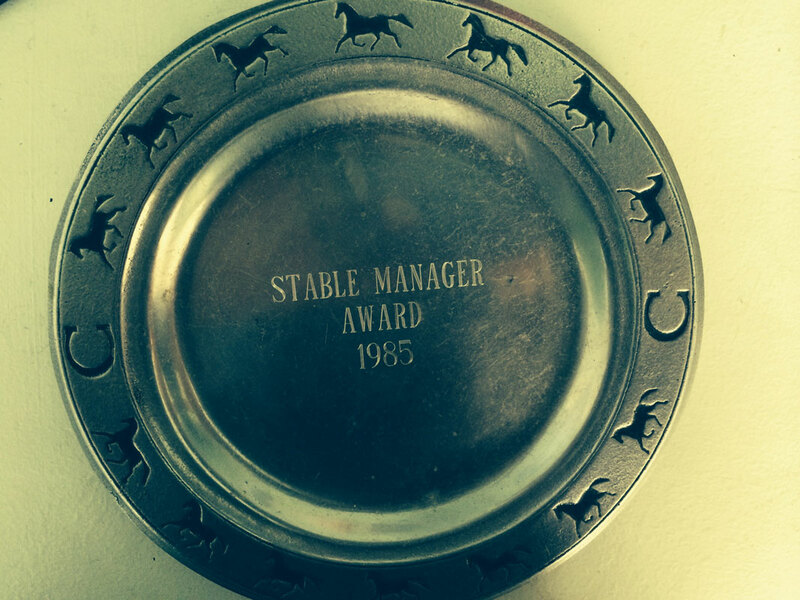 Remind me to tell you of a stable management award that was once won. I too, am so thankful not to be horseless! I sure wish it ad happened to me a lot earlier in life, but I will enjoy every min! Oh, I remember those days. I knew every horse within miles of where I lived. I traded every type of odd job for precious time with horses. I was there. I had been horseless since the age of 12. I went to horse camp for several week long (sometimes 2 if I was lucky) summers. I knew for sure that no matter what I would own a horse. 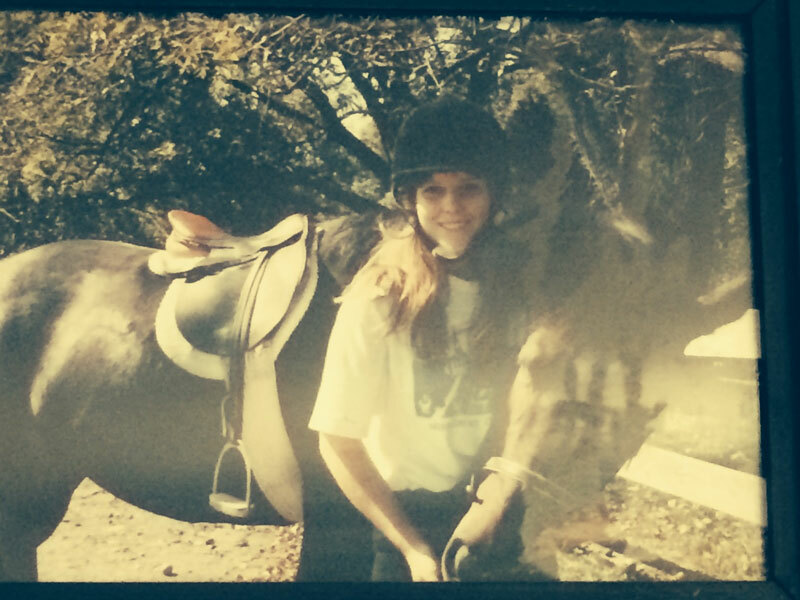 In 1999 at the age of 30+ I bought a horse. a then 16 y/o swaybacked QH mare with an attitude. It was euphoria for me. I’ve bought and sold horses not being able to find the “right fit” and then I lost my job in 2012 and sadly had to sell the horse I had at that time. I am horseless now and I hate every single minute of it. The only horse fix I have now is either do a riding lesson when the money is available (which isn’t many times) or pamper my best friends haflinger mare — I don’t ride this horse. She’s good for my friend but I don’t want to ride this horse. I just want to bond with her on the ground. Am looking for something now but it’s hard to find a beginner all-around color breed not exceeding 15.2hh in my state at a price that I can afford. Just keep looking.